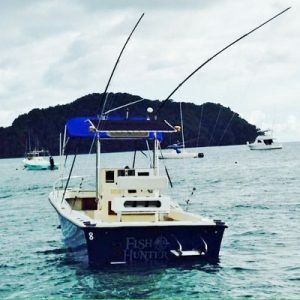 This highly-recommended custom-built 26-foot Fish Nautiqe center console powered by a 210HP Cummins inboard diesel is out of Herradura Bay near Los Sueños Marina. Captain Juan Sirias, who specializes in inshore fishing, is at the helm. Cruising at 23 knots, she is equipped with Furuno sounder; Standard Horizon GPS; Raymarine radio; stereo; marine head (toilet) inside the console; outrigger and downriggers; and carries Shimano rods and Tiagra and Tyrnos Shimano reels plus an abundant array of lures.